Is the Sky is Clear Above All Georgia? 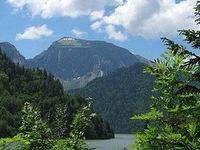 In December Abkhazia will hold another Presidential elections. Official election campaign hasn’t started yet, but its general lines are pretty evident. In a sense we can talk about return to the situation of 2004 – but in a mirror reflection. Acting president Sergei Bagapsh, who 5 years ago was imaged by the Kremlin in “friendly” Mass Media as an agent of influence of Tbilisi and the protégé of Georgian mafia Godfather, leads a policy, which is difficult to characterize differently than “extremely-pro-Moscow”: he reauthorizes the security of Abkhaz border to the Frontier service of the Russian Federation Federal Security Service, or he invited Russia to locate in the Republic military and military-marine basis, or he lobbies through the Parliament with his authority the law-draft on “Privatization of Republican and Municipal property”, allowing foreigners – especially Russians – to purchase real estate in the Republic, i.e. gives the only rail way of Abkhazia in a trust management for 10 years RAO “RZhD”, or changes Georgian phone codes on Russian ones. 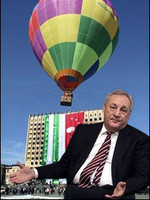 As for Raul Khajimba – an absolute favourite of the Kremlin during previous elections who is close to the Russian Federation Prime Minister Vladimir Putin – together with other politicians opposing to the official Sukhumi soundly protest against senseless granting to Moscow of all clues for the management of the Republic and its assets. However, upon closer view the paradox appears to be imaginary. In current situation, when Georgia has an absolute support of the USA, EU and NATO, intensively develops the scope and efficiency of blockading measures towards Abkhazia, local elites in reality has no other public channels to fulfill its vitally important interests, except for Russian ones. This supposes the continuation of dependence of the smaller partner from the bigger one. But then, from the view point of those Abkhazian interests of proceeding the course of closure with Russia – which is still associated with the ruling tandem “Begapsh-Ankvab” – not only devaluate the idea of independence itself, but also obtains the character of “crawling expansion from north”. Considering incomparable scales of the two states economies, uncontrolled flow of Russian investments to Abkhazia threatens local elites with fast and inevitable marginalization, forcing them to ask themselves: “Is Moscow hegemony that better than of Tbilisi?”. As a result, the protest against “pro-Moscow” policy of the ruling regime obtains mass character in Abkhazia, consolidating most various political forces and social groups “on the background of general growth of anti-Russian climate” (the comments of one of the famous opposers, “dollar billionaire” Beslan Butba). And candidates for President simply can’t ignore the new trend in this pre-election campaign. As for Sergei Bagapsh, considering the rate of falling of his own popularity, he has nothing else to do, but to support his electoral weight artificially with such extravagant measures, which can’t be attributed to the “influence of Moscow” by no means. This way, in the very end of July this year kindly speaking “lobbied” by the acting President through the Parliament of Abkhazia a new edition of the law on citizenship was literally pushed in three readings. This edition sufficiently eased the naturalization for ethnic Mingrelians, inhabiting mainly the boarder areas of Gala region. The “subjective-pro-Georgian” character of this step shouldn’t be exaggerated – here the case is not in the influence on Sergei Bagapsh of his Mingrelian wife or her relatives. It’s just the new edition allowed to adopt Abkhaz citizenship fast for 45-55 or up to 65 thousand people by various estimations. Within the scale of the country, where at the moment there are 193 thousand voters, this is a very serious electoral factor. And it’s easy to predict the candidate for which these new citizens will vote this December. Opposition interpreted this new edition of the law not just like an attempt of legal “input” of votes, but like a threat to the very fundament of Abkhaz nationhood – the beginning of “silent” revanche of Tbilisi. And it’s difficult to argue this – as in Georgia there are still from 200 up to 300 thousand of Mingrelian and Kartvelian refugees from Abkhazia. What happens, if they will also apply for the citizenship of their “historic motherland”, the total population of which today doesn’t accede 230 thousand of people?! Pretty predictable the awkward attempt of the acting President to “gather” for himself the electorate exploded Abkhaz society, and in the beginning of August the new law was send to review. Since then it hasn’t been mentioned… Although on September 29th Sergei Bagapsh signed the decree “On levy in October-December 2009 of all citizens of Abkhaz Republic for military service…” “which particularly states that Abkhaz citizens aged up to 35 should be called-up “able to carry military service, but didn’t carry it from 18-27 due to the traveling abroad the Republic of Abkhazia”. It means that still passports are silently issued, - and not only for local Mingrelians, but even for repatriates?! This or that, the story with the arguable law marked a pretty curious trend: the more Sergei Bagapsh leans to Moscow, the more he is perceived as a pro-Moscow by the public opinion of the Republic, the more he becomes interested – not to say dependent – in the support of those groups of “Abkhaz population”, who in 1993 went away (or were ready to move) to Inguri. And it means – of Georgia. It seems that in Tbilisi they understand it perfectly and stake seriously on the current Head of state. He is criticized in Georgian Mass Media – especially in their English versions and generally oriented for foreign readers – very moderately. By no means personally – only “in the office”: everything that he does uncomplimentary for Georgia, refers to the “Moscow imperialism” and no abstract local “radicals” and “war criminals”. 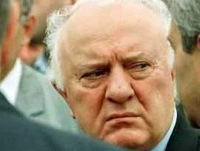 Sergei Bagapsh himself is steadily characterized – from the name of various “personally acquainted” persons of Georgian political establishment – as an experienced administrator-manager, pragmatic politician and in general a “good person”. According to some data, in case of the victory of Sergei Bagapsh in Presidential elections, Tbilisi intends in some time to address to him with a plan of Georgian-Abkhaz conflict regulation, which is in its essence a kind of an upgrade of the offer, already presented – under unofficial sources – by the regime of Saakashvili to Moscow previous summer, two weeks before the beginning of the “5 days war”. We are talking about “Bosnization” of Georgian-Abkhaz conflict: the division of the region – approximately by Kodor – into two isolated cantons: Abkhaz and Georgian-Mingrelian. Moreover, they both, recognizing to some extent the supreme sovereignty of Tbilisi, de facto will be under the protectorate of international peacemaking forces – not Russian, but acting under the aegis of NATO or the EU. The effectiveness of the kind of scheme for Georgia is evident. In its essence the thing is not only about the only one possibility in these conditions of moral triumph which arose after August 2008, but about the return of the half of Abkhazia in practice. With an option for the rest part within a middle-term prospect. The repetition of “Bosnian” scenario in Transcaucasia provides for NATO a steady ground for its presence and simultaneously gives it an effective instrument of pressure on Tbilisi: the constant threat to recognize the regime of Sukhumi. Is this variant acceptable for Abkhaz elites? For the ruling one -- absolutely “yes”. As it means the way out of international isolation without support of Moscow – and, which is especially important, at least partial recognition of fait accompli repartition of property: and the one resulted from the war of 1992/3., and the one later – and the one that can occur in future. And this is all by preservation a principal possibility of wide international recognition of their independence (Kosovo precedent) and in the extreme, the most unfavorable case – another asking for help in Moscow. And which is especially important – psychologically current Abkhaz regime, judging by the total situation, has already “matured” to consider the kind of offer.